Fantastic Faro is a dream come true for nature lovers who love nothing better than exploring islands, beaches, and coastlines as they take in the stunning Algarve views, camera in hand! Ria Formosa Natural Park is literally a stones throw away and whether you visit it on a 1 island boat trip, a 3 island boat trip, or a segway tour you're going to be blown away by the views of the lagoon and barrier islands that are unique to this region and host a variety of birdlife including pretty pink flamingos. Wander the white sandy shores, eat the delicious seafood, and explore the coastal towns as you discover the unique culture and even more unique ecosystem here – Don't miss out on the beautiful sunset views either with a romantic sunset cruise! Putting picturesque islands to one side, but keeping to the sea, you can also visit the sea caves and you might even get lucky enough to see friendly dolphins playing in the Atlantic ocean, both of these options available to do on a catamaran boat or on a fun pirate ship boat trip. 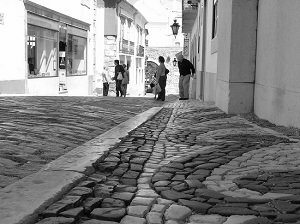 Moving on to land, be sure to explore Faro old town on a fun daytime or night time segway tour as you learn the history of the town and see all of the most important churches and monuments. Tripindicator price-compared tours in Faro and have compiled a Top rated trips in and around the Faro, complete with our best tips, customer reviews, and directions on how to get there. 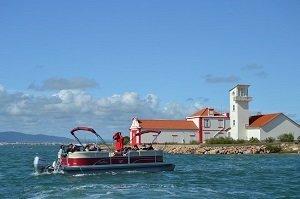 A half-day sightseeing boat trip from Faro to Ria Formosa Nature Park. Sail through the channels of the coastal lagoon and stop off at 4 islands to enjoy beaches, swimming, and sightseeing. Enjoy live commentary on board from an experienced local guide. Depart from Faro port travelling by small boat to Ria Formosa Nature Park. Stop off to explore 4 islands as you take in the stunning views of the coastal lagoon. Learn about the impressive biodiversity of this region. Time to explore the islands on your own. This tour has a 5 star rating on Tripadvisor with people saying it's very well organized. Travelers describe this tour as a 'Must Do' when in Faro. They say that the guides are very knowledgeable and friendly, and the boat comfortable. Great if you want to see some of Faro's natural beauty. Although there is a guide onboard the boat this is not a guided tour – You'll need to be comfortable going off and exploring on your own. Perfect for people who love nature but also those interesting in learning about the biodiversity and the local culture. A 2 hour boat trip along the Algarve coast. See caves and rock formations. Take in the beauty of the Algarve coast between Albufeira Marina and Carvoeiro beach. See dolphins swimming in their natural habitat and stunning caves. Learn interesting facts from a friendly guide. Return travel on a small comfortable boat. Live commentary on board from an English speaking guide. 2 hours on the Algarve coast. Travellers are very happy with this tour on GetYourGuide, one person going as far as to say it was the highlight of the holiday! Others say the trip was perfect and a great experience. People report that the guide is friendly and informative. Great if you enjoy boat trips on the open water. 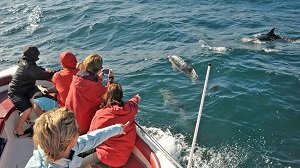 A must-do for anyone who wants the chance to see dolphins in their natural environment. Not suitable for pregnant women or those with lower back problems due to the bouncing of the boat over the waves. A 1 hour catamaran cruise at sunset with commentary. Watch the beautiful sunset scene unfold over the lagoon. Sail past some of the barrier islands that form the Ria Formosa Natural Park. Sail out to the lagoon at Ria Formosa Natural Park. Watch the stunning sunset spectacle from the boat. Cruise back to Faro port past the barrier islands. 1 hour catamaran boat trip. Breathtaking sunset views and natural scenery. Limited to 12 people for maximum enjoyment. With ratings of 4.8 and 5 stars this is a trip that gets great responses from travellers. People describe it as 'Breathtaking' 'Stunning Views', and 'Absolutely Perfect'. Travellers would highly recommend this trip to others who want to see a spectacular sunset. A must-do if you appreciate sunsets and nature scenes. A return ticket to Ilha Deserta in Ria Formosa Natural Park. Travel to and from the island by small catamaran boat. Explore the island at your own leisure - Ticket is for transport only. Get the catamaran ferry boat to Ilha Deserta aka Desert Island from Faro. Pass by beautiful scenery on the 45minute journey. Catch the ferry back to Faro marina when you're done. Roundtrip to Ilha Deserta in Ria Formosa Natural Park. 45minute journey through the lagoon and past the barrier islands. Multiple departure times to suit you. This trip gets 4 and 5 star reviews from happy travellers. They say the journey is fabulous with pleasant people working onboard. 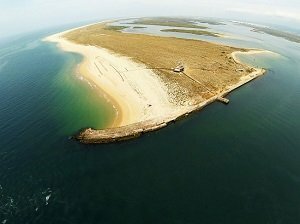 Ilha Deserta is highly recommended, and if you visit off-season it truly is a deserted island! Great if you want to spend some time on a tiny island for either a couple of hours or the whole day. Ticket is for transport only so you need to be comfortable with going off and doing your own thing, this is Not a guided tour. A great way to reach the island allowing you to spend as much or as little time there as you want. A 2 hour cruise on a pirate boat along the Algarve coast. Fun and entertainment for the whole family. See picturesque views and learn interesting facts about this stretch of coast. See the beautiful Algarve coastline enjoying breathtaking views. Sail past picturesque white sandy beaches and beautiful caves and grottos. Look out for dolphins and enjoy a swim in the crystal clear water. A trip aboard the Pirate Ship Leaozinho on a 'Captain Hook' tour. Information from friendly informative guides aka pirates on the history of the coast and pirate activity. 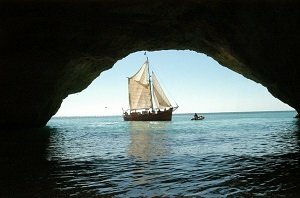 Observe the caves and beaches of Albufeira, Sao Rafael, Castelo, and Gale. This tour receives a lot of good reviews with people saying it's 'A Good Laugh' and 'Worth It'. The guides onboard are fun, friendly and informative. Travellers highly recommend the trip and some say it was their best memory. A short yet enjoyable lighthearted trip to see some of the beautiful Algarve scenery and learn about the history of pirates along this coastline. Fun for the whole family, with kids getting the chance to dress up like a pirate. Best to avoid if you know you suffer from seasickness. A half-day catamaran boat trip to 2 islands within Ria Formosa Natural Park. See Deserta Island and Farol Island. Ria Formosa Natural Park is a lagoon system with barrier islands named 1 of the 7 Natural Wonders of Portugal. Sail through the channels of Ria Formosa enjoying the beautiful scenery. Stop at Farol island for 1 hour to walk the streets and see the lighthouse. 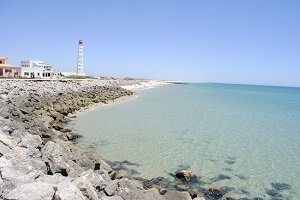 Stop at Deserta Island for 30 minutes to enjoy a swim at the most southern point of Portugal. Return boat trip from Faro to 2 islands in Ria Formosa. Time to explore the 2 islands on your own. An experienced skipper providing live commentary on the journey. This tour receives high praise from travellers who highly recommend it to others. People say it's a fantastic trip and a great day out. People report that the guide is friendly and informative, only too happy to stand guard over shoes and bags as people get off to explore! 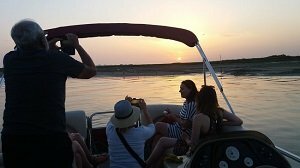 A great way to experience the Ria Formosa Natural Park if you don't have much time. A fun trip for the whole family. Nature lovers will think they landed in paradise! A 90 minute segway Tour at Rio Formosa Natural Park. Ria Formosa is 1 of 7 Natural Wonders in Portugal. See the variety of bird life at the Ludo nature reserve and learn about the ecosystem. 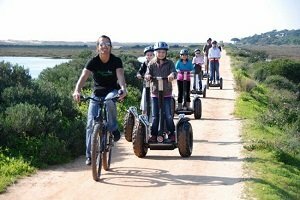 Ride along the paths of Ria Formosa on a Segway as part of a small group. Take in the beautiful scenery and see the birds and other wildlife. An English speaking guide will instruct you on using the segway and give you information about the ecosystem. Use of the segway with helmet and binoculars. Insurance incase you hurt yourself. This segway tour gets 5 stars on TripAdvisor and GetYourGuide and comes highly recommended. People say it's something totally different and great fun. People warn not to expect much birdwatching if visiting outside of the migratory period. A trip that's a little bit different from the norm! Don't worry if you've never ridden a segway before - The guide will teach you, even children can operate them. Perfect if you love nature and want to be able to see some of the local wildlife. A 90 minute segway tour around Faro. A cultural city tour to see the most important monuments and sites. Explore Faro by segway with your guide during the day or at night. See Largo da Se, the 18th-century Jewish cemetery, the arabesque Arco de Repouso and more. Cruise through the lively streets of the old town on your segway past shops, museums, monuments and bars. Learn about Faro from your local friendly and informative guide. A 90 minute guided segway tour. Commentary from a local, English Speaking, guide. This cultural tour gets 5/5 on all of the top sites; Tripadvisor, GetYourGuide, and Viator. People say that it's great fun and the guide is friendly and informative. Travellers have used the following described the tour as 'Great Fun' and 'A Super Tour'. A fun tour for the whole family - Kids can take part if they weight over 20kg. A great introduction to the old town and a truly fun and unique way to explore the city streets. A unique experience for culture vultures who enjoy sightseeing but dislike walking!